IGNACIO ZARAGOZA N° 58, COLONIA XALTIPAC, CHIMALHUACAN, C.P. DOMICILIO CONOCIDO, SAN JOSE DEL SITIO, JIQUIPILCO, C.P. 50800, Tel. CARRIL N° 8, SAN MATEO NOPALA, NAUCALPAN, C.P. 53220, Tel. COLONIA LA PRESA PRIMERA SECCION, NAUCALPAN DE JUAREZ, C.P. CALLE 5 DE NOVIEMBRE N° 5, COLONIA REVOLUCION, CHICOLOAPAN, C.P. CALLE GUERRERO NO. 90, COL. RAUL ROMERO, NEZAHUALCOYOTL, C.P. MEXICO, CHALCO, C.P. 56600, Tel. ESQ. DE ALLENDE Y PALMAS HUEXOTLA, TEXCOCO, C.P. 54000, Tel. SGAR/1157/93 "LA COMISION DEL CALVARIO DE MEXICO"
PEDREGAL, ATIZAPAN, C.P. 52972, Tel. CRISTIANAS "MANANTIAL DE LA VIDA"
DALIA, MZ. 75, LT. 10, COL. JARDINES DE CHALCO, CHALCO, C.P. 0, Tel. ATIZAPAN DE ZARAGOZA, C.P. 54500, Tel. SGAR/125/93 IGLESIA DE DIOS ISRAELITA "AURORA"
DOMICILIO CONOCIDO, SAN FELIPE DEL PROGRESO, C.P. 50640, Tel. CALLE ORIENTE 43 No. 21, COLONIA UNION DE GUADALUPE, CHALCO, C.P. SGAR/13:1018/03 IGLESIA BAUTISTA CRISTO VIVE EN CD. CIRCUITO ECONOMISTAS N° 168, CIUDAD SATELITE, NAUCALPAN, C.P. SECCION, NEZAHUALCOYOTL, C.P. 57750, Tel. DE NAUCALPAN, EDO. DE MEXICO"
HUERTAS 3A SECCION, NAUCALPAN, C.P. 53427, Tel. EJIDO PALOMAS, MUNICIPIO DE CIUDAD DEL MAIZ S.L.P. LA QUEBRADA, CUAUTITLAN IZCALLI, C.P. 54769, Tel. COLONIA OLIMPIADA 68, NAUCALPAN DE JUAREZ, C.P. 53690, Tel. ROSARIO, TLALNEPANTLA, C.P. 54000, Tel. MIRAMAR N° 11, SECCION CUMBRIA, CUAUTITLAN IZCALLI, C.P. 54740, Tel. SGAR/13:134/95 IGLESIA BAUTISTA SINAI DE CD. AV. SOR JUANA INES DE LA CRUZ N° 188, COLONIA METROPOLITANA 2a. SECC, NEZAHUALCOYOTL, C.P. 57730, Tel. SECC., ECATEPEC, C.P. 55220, Tel. SGAR/13:142/95 PRIMERA IGLESIA BAUTISTA DE TOLUCA, MEX. AV. ISMENE N° 23, COLONIA IZCALLI RINCONADA, TULTITLAN, C.P. 54930, Tel. TLALNEPANTLA DE BAZ, EDO. DE MEX. REVOLUCION N° 301, ESQUINA VALLE DE BRAVO, TLALNEPANTLA, C.P. SGAR/1321/93 "COMUNIDAD CRISTIANA DE CUAUTITLAN"
CHAMAPA, NAUCALPAN DE JUAREZ, MEX. SGAR/13:451/96 IGLESIA CRISTIANA BAUTISTA JESUCRISTO ES MORELOS N° 28-B, COLONIA SAN RAFAEL CHAMAPA, NAUCALPAN, C.P. EL SEÑOR DE SAN RAFAEL CHAMAPA, NAUCALPAN, MEX. SGAR/13:453/96 IGLESIA BAUTISTA BETSAN DE COL. STA. ALHELI LOTE 19, MANZANA 21, COLONIA SANTA CLARA, TULTITLAN, C.P. DEL ROSAL, MPIO. DE ATLACOMULCO, EDO. DE MEX. SGAR/1352/93 "IGLESIA DE DIOS APOSTOLICO DE CRISTO"
TLACOTEPEC, MPIO. DE ATLACOMULCO, EDO. DE MEX. CASANDEJE, MPIO. DE JOCOTITLAN, EDO. DE MEX. TLACOTEPEC, ATLACOMULCO, C.P. 50450, Tel. JALPA, MPIO. DE SN. FELIPE DEL PROGRESO, EDO. DE MEX. 6, SAN FELIPE DEL PROGRESO, C.P. 50640, Tel. VIEJA, MPIO. DE VILLA VICTORIA, EDO. DE MEX. POSTAL 3, COLONIA VALLE VERDE, VILLA VICTORIA, C.P. 50141, Tel. DE LOS BAÑOS, IXTLAHUACA, C.P. 50740, Tel. BOMBATEVI, ATLACOMULCO, EDO. DE MEX. DISTRITO DE EL OR, ATLACOMULCO, C.P. 50450, Tel. ORO DE HIDALGO, ATLACOMULCO, C.P. 50480, Tel. SAN FELIPE DEL PROGRESO, C.P. 50640, Tel. FRANCISCO COAXUSCO, MPIO. DE METEPEC, EDO. DE MEX. SN. FRANCISCO COA, METEPEC, C.P. 52140, Tel. AMARILLOS, MPIO. DE ALMOLOYA DE JUAREZ, EDO. DE MEX. TOLUCA, ALMOLOYA DE JUAREZ, C.P. 50900, Tel. DISTRITO D, ATLACOMULCO, C.P. 50450, Tel. 306, COLONIA VA, ZINACANTEPEC, C.P. 50140, Tel. IXTLAHUACA, JOCOTITLAN, C.P. 50704, Tel. CONCEPCION, MPIO. DE SAN FELIPE DEL PROGRESO, EDO. DE JOSE DEL RINCON, C.P. 50640, Tel. TLALCHICHILPA, MPIO. DE SAN FELIPE DEL PROGRESO, EDO. FELIPE DEL PROGRESO, C.P. 50640, Tel. DE IXTLAHUACA A., SAN FELIPE DEL PROGRESO, C.P. 50640, Tel. TLALCHICHILPA, MPIO. DE SAN FELIPE DEL PROGRESO, EDO. IXTLAHUACA, SAN FELIPE DEL PROGRESO, C.P. 50640, Tel. SANTIAGO CASANDEJE, MPIO. DE JOCOTITLAN, EDO. DE MEX. IXTLAHUACA, JOCOTITLAN, C.P. 50707, Tel. TENANGO DEL VALLE, MPIO. DE TENANGO DEL VALLE, EDO. TENANGO DEL VALLE, C.P. 52300, Tel. LA PAZ, EDO. DE MEX. CALLE 16 N° 33, COLONIA VALLE DE LOS REYES, LOS REYES LA PAZ, C.P. COLONIA HANK GONZALEZ, ECATEPEC, C.P. 55520, Tel. ARAGON 3a. SECCION, ECATEPEC, C.P. 55280, Tel. PAZ DE CUAUTITLAN IZCALLI, EDO. DE MEX. JACARANDAS S/N, COLONIA SAN ISIDRO, CUAUTITLAN IZCALLI, C.P. , Tel. DEL MUNDO DE ECATEPEC, EDO. DE MEX. JAJALPA, ECATEPEC, C.P. 55090, Tel. CAMPANILLAS No. 205, VILLA DE LAS FLORES, COACALCO, C.P. 55710, Tel. AZUL, TLALNEPANTLA, C.P. 54020, Tel. AGUSTÍN, 2a., ECATEPEC, C.P. 55130, Tel. SATELITE, NAUCALPAN, C.P. 0, Tel. SGAR/1404/94 "LAS IGLESIAS LOCALES EN MEXICO"
SGAR/1464/93 "EL REINO DE DIOS EN SU PLENITUD"
AV. MIGUEL ALEMAN NO.29, COL. INDUSTRIAL, OZUMBA, C.P. 56800, Tel. CALLE B NO. 11, COL. CERVECERA MODELO, NAUCALPAN, C.P. 53120, Tel. RISCO N° 19, TLALNEPANTLA DE BAZ, C.P. 54080, Tel. SGAR/1495/94 IGLESIA DE DIOS PENTECOSTES "FILADELFIA"
CALLE ME VOY N° 258, COLONIA ESPERANZA, NEZAHUALCOYOTL, C.P. GUERRERO NO. 20, FRACC. CALACOAYA, ATIZAPAN DE ZARAGOZA, C.P. AV. HIDALGO PTE. 1201, COL. RIVA PALACIO, TOLUCA, C.P. 50080, Tel. CALLE 33 N° 157, COLONIA ESTADO DE MEXICO, NEZAHUALCOYOTL, C.P. PASEO TOLLOCAN NO. 512 OTE. VALLE VERDE-TERMINAL, TOLUCA, C.P. FELIPE ANGELES NO. 122, COL. DEL PARQUE, TOLUCA, C.P. 50180, Tel. VALLE SANTIAGO N° 95 ESQ. CON YANGZE, COLONIA VALLE ARAGON 1A. CALLE 1 NO. 26, COL. SAN MARTIN DE PORRES, LOPEZ MATEOS, C.P. SGAR/1648/94 IGLESIA "EL FUTURO ES NUESTRO"
SGAR/1649/94 IGLESIA Y MINISTERIOS "LA GRAN COMISION"
UNION DE GUADALUPE, VALLE DE CHALCO, CHALCO, C.P. 56600, Tel. SAN ANTONIO ATIZAPAN N° 19, COLONIA LAS HACIENDAS, METEPEC, C.P. LUREL LT. 4, MZ. 31, TLAPACOYA, IXTAPALUCA, C.P. 56560, Tel. SGAR/1768/93 HERMANAS DOMINICAS DE LA REINA DEL STO. DE AMOR Y RESTAURACION FAMILIAR"
CARR. CHALCO-MIXQUIC KM.2, APART. POST.56, CHALCO, C.P. 56600, Tel. SGAR/1901/94 "TEMPLO EL DIVINO MAESTRO"
CALLE PRIMERO DE MAYO N° 110, COLONIA CENTRO, TOLUCA, C.P. , Tel. AV. DEL TESORO S/N, COL. EL RESORO, TULTITLAN, C.P. 54940, Tel. TOLTECAS NO. 18, COL. SAN JAVIER, TLALNEPANTLA, C.P. 54030, Tel. FRAY PEDRO DE GANTE N° 2, CENTRO, TEXCOCO, C.P. 56100, Tel. NORTE No. 522, A.P. 22, COL. MORELOS, ATLACOMULCO, C.P. AV. FERROCARRIL S/N, AP. POSTAL No. 268, CHALCO, C.P. 56600, Tel. LAGOS,FRACCIONAMIENTO JARDINES DE MORELOS, ECATEPEC, C.P. CALLE EJIDO DE TEZOMPA, LOTE 47, COLONIA AGRARISTA, CHALCO, C.P. AV. HIDALGO N° 17, COLONIA CENTRO, ATLACOMULCO, C.P. 50450, Tel. AV. MANUEL GONZALEZ Y PAVO REAL S/N, COATLINCHAN, TEXCOCO, C.P. LOMAS DE TECAMAC, TECAMAC, C.P. 55765, Tel. LOTE 1, ZONA 1, COLONIA N, TOLUCA, C.P. , Tel. LAGO GUIJA NO. 98 Y 100, COL. CIUDAD LAGO, NEZAHUALCOYOTL, C.P. AGUSTINAS RECOLETAS EN TECAMACHALCO, MEX. AV. 5 DE MAYO N° 130, COLONIA AGUA AZUL, NEZAHUALCOYOTL, C.P. VALLE, COACALCO, C.P. 55800, Tel. SGAR/2332/98 CENTROS DE FE FAMILIAR ROCA DE SALVACION AV. TRANSPORT, CHIMALHUACAN, C.P. 56330, Tel. "CASA DE ORACION DEL DIOS VIVIENTE"
MIGUEL SUR (CHA, ATIZAPAN DE ZARAGOZA, C.P. 52928, Tel. JESUS GONZALEZ ORTEGA N° 9, COLONIA LA MERCED, JILOTEPEC, C.P. SGAR/2371/99 "HIJAS DE LA MISERICORDIA Y DE LA CRUZ"
CALLE VICENTE GERRERO S/N, BARRIO DE SAN MARTIN, TULPETLAC, C.P. SGAR/2442/00 "LA GLORIA DE JEHOVA"
PENTECOSTESES DE LA REPUBLICA MEXICANA"
IGNACIO PARRA N° 33, AJOLOAPAN, HUEYPOXTLA, C.P. , Tel. SANTA ROSA DE LIMA, CUAUTITLAN IZCALLI, C.P. 54748, Tel. ANTONIO BONIXI, IXTLAHUACA, C.P. 50783, Tel. RANCHO MARGARITA, DONATO GUERRA, C.P. 0, Tel. DONATO GUERRA, C.P. , Tel. UNIDAD JOSE MARIA MORELOS Y PAVON, TULTITLAN, C.P. , Tel. AVENIDA MEXICO NUMERO 158, TULPETLAC, C.P. 55400, Tel. BOULEVARES, NAUCALPAN DE JUAREZ, C.P. 53140, Tel. TLALPIZAHUAC, IXTAPALUCA, C.P. 56330, Tel. SECCION, NEZAHUALCOYOTL, C.P. 57100, Tel. SGAR/2730/05 "MINISTERIOS RESTAURACION Y VICTORIA"
IZCALLI SANTA CLARA, ECATEPEC DE MORELOS, C.P. 55238, Tel. SGAR/2748/05 "A LA LUZ DEL CANDELERO"
CUAUTITLAN IZCALLI, C.P. 54720, Tel. SGAR/2775/05 "LOS AYOS DE JESUCRISTO"
AV BAJA VELOCIDAD NUMERO 44 COLONIA PILARES, METEPEC, C.P. SGAR/2783/05 "IGLESIA DE CRISTO MINISTERIOS FILADELFIA"
TERCERA SECCION, NEZAHUALCOYOTL, C.P. 57750, Tel. TEQUESQUINAHUAC, TLALNEPANTLA, C.P. 54030, Tel. SGAR/278/93 MINISTERIOS DE SALVACION "PENTECOSTES"
SGAR/2791/05 "IGLESIA CRISTIANA TIERRA DE BEULAH"
NAUCALPAN DE JUAREZ, C.P. 53790, Tel. DORADO, TLALNEPANTLA DE BAZ, C.P. 54020, Tel. SGAR/2799/06 "MISION DE LAS BUENAS NUEVAS MEXICO"
SAN FRANCISCO CHILPAN II, TULTITLAN, C.P. 54959, Tel. SGAR/2819/06 ASOCIACION MINISTERIAL "SEÑALES DE VIDA"
CAMINO SAN PABLO S/N, COLONIA SAN MATEO TECALCO, TECAMAC, C.P. COLIMA N° 1, COLONIA SAN FRANCISCO CUAUTLIQUIXCO, TECAMAC, C.P. CALLE ALZATE N° 10, CENTRO, CHALCO, C.P. 56600, Tel. CALLE RAYON N° 103-BIS, COLONIA CENTRO, TEXCOCO, C.P. 56100, Tel. SGAR/2865/06 FRATERNIDAD CRISTIANA "MONTE DE SION"
DOMICILIO CONOCIDO EN EL EJIDO DE DETIÑA, ACAMBAY, C.P. 50300, Tel. CALLE 14 DE ABRIL NUMERO 8, COLONIA CENTRO, TONANTITLA, C.P. TLALMIMILOLPAN, LERMA, C.P. 52000, Tel. CALLE BETUNIAS N° 54, COLONIA GRANJAS SAN PABLO, TULTITLAN, C.P. ARROZ, COLONIA LOMAS DE SAN MIGUEL, ATIZAPAN DE ZARAGOZA, C.P. ZAPATA, ECATEPEC DE MORELOS, C.P. 55020, Tel. LAS AGUILAS, NEZAHUALCOYOTL, C.P. 57002, Tel. SECCION, CIUDAD NETZAHUALCOYOLT, C.P. 38540, Tel. ATIZAPAN DE ZARAGOZA, C.P. 52947, Tel. FELIPE DEL PROGRESO, DISTRITO DE IXTLAHUACA, C.P. 50640, Tel. SGAR/3326/09 "HERMANAS DEL BUEN SAMARITANO"
AV. MIRAFLORES N° 26, BARRIO DE TULA, TLALMANALCO, C.P. 56700, Tel. SGAR/3369/10 IGLESIA CRISTIANA "DIOS HABLA HOY"
FRACCIONAMIENTO CIUDAD SATELITE, NAUCALPAN, C.P. 53100, Tel. SGAR/3444/10 "IGLESIA PIEDRA VIVA ESCOGIDA Y PRECIOSA"
SGAR/3450/10 IGLESIA "EL GRAN DAVID"
TLAMIMILOLPAN, SANTIAGO CUAUTLALPAN, TEXCOCO, C.P. 56370, Tel. MEXICO N° 105, SAN CRISTOBAL HUICHOCHITLAN, TOLUCA, C.P. SGAR/3491/10 "SACERDOTES AMIGOS DE JESUS"
CALLE JUAREZ N° 15, BARRIO DE BELEM, PAPALOTLA, C.P. 56050, Tel. CALLE INDIOS VERDES NO. 82, 2O. PISO, COL. METROPOLITANA 2A. SGAR/3553/11 "LA IGLESIA DE DIOS"
NAUCALPAN DE JUAREZ, C.P. 53580, Tel. LOMA, TLALNEPANTLA DE BAZ, C.P. 54060, Tel. CALLE MOCTEZUMA N° 3, CHICOLOAPAN DE JUAREZ, C.P. 56370, Tel. SGAR/3607/11 "IGLESIA MOISES Y ELIAS"
DE CATEMACO, COLONIA LA LAGUNA, ECATEPEC, C.P. 55070, Tel. REYES, LOS REYES LA PAZ, C.P. 56400, Tel. SGAR/3642/12 "CASA DE ORACION LA FUENTE VIVA"
OPALO N° 74, COLONIA FUENTES DEL VALLE, TULTITLAN, C.P. 54910, Tel. CALLE PRIVADA DE LA CRUZ S/N, COLONIA BELLA VISTA , METEPEC, C.P. CALLE ORIENTE 38, MANZANA 177, LOTE 12, COLONIA GUADALUPANA 2A. COLONIA SAN SEBASTIAN CHIMALPA, LOS REYES LA PAZ, C.P. 56520, Tel. CALLE LIMON S/N, COLONIA PLUTARCO ELIAS CALLES, IXTAPALUCA, C.P. SGAR/3751/13 "IGLESIA FAMILIA CRISTIANA DE ACAMBAY"
FRANCISCO CUAUHTLIQUIXCA, TECAMAC, C.P. 55760, Tel. COLONIA JARDINES DE SANTA CLARA, ECATEPEC DE MORELOS, C.P. ATLAPULCO, CHIMALHUACAN, C.P. 56346, Tel. CALLE LAZARO CARDENAS N° 44, SAN PEDRO TULTEPEC , LERMA, C.P. MORELOS, ECATEPEC DE MORELOS, C.P. 55070, Tel. DOMICILIO CONOCIDO SAN MIGUEL TOTOLMAYOLA, SULTEPEC, C.P. , Tel. SGAR/3853/14 IGLESIA DE CRISTO MINISTERIOS "JOEL 2:1"
ESTRELLA DE ORIENTE, ECATEPEC DE MORELOS, C.P. 55237, Tel. AV. VALLE DE BRAVO No.136, COL. MARAVILLAS, NEZAHUALCOYOTL, C.P. CALLE 1 No. 22 COL. EL OLIVO, APDO. POSTAL 54000, TLALNEPANTLA, C.P. DOMICILIO CONOCIDO, SAN MATEO DEL RIO, IXTLAHUACA, C.P. 50740, Tel. No.21, COL. LA SOLEDAD TENAYUCA, TLALNEPANTLA, C.P. SGAR/435/93 IGLESIA DE DIOS EN JILOTEPEC "CRISTO VIENE"
CALLE ISMAEL REYES RETANA, PRIVADA 110, JILOTEPEC, C.P. 54240, Tel. AV. 11 No.132, COL. ESPERANZA, NEZAHUALCOYOTL, C.P. 57800, Tel. 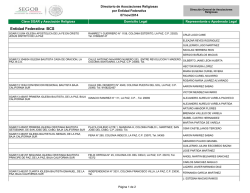 SGAR/496:2/96 TEMPLO JOSEFINO DE LA SAGRADA FAMILIA DE ISABEL LA CATOLICA No.302 SUR, TOLUCA, C.P. 50090, Tel. VICENTE GUERRERO S/N, AMATEPEC, C.P. 51500, Tel. JORGE JIMENEZ CANTU NO. 20, BEJUCOS, TEJUPILCO, C.P. 51460, Tel. HIDALGO Y VICENTE GUERRERO S/N., PALMAR CHICO, AMATEPEC, C.P. AV. PRINCIPAL S/N, ACATITLAN, TEJUPILCO, C.P. 51400, Tel. PLAZA ELMILIANO ZAPATA S/N., VILLA LUVIANOS, C.P. 51440, Tel. ISIDRO FAVELA S/N., OTZALOAPAN, C.P. 51130, Tel. PLAZA HIDALGO NO.1, TEJUPILCO, C.P. 51400, Tel. AV. IZTACALA No.247, COL. LOS REYES IZTACALA, TLALNEPANTLA, C.P. AV. GUSTAVO A. VICENCIO N° 214, XONACATLAN, C.P. 52060, Tel. SGAR/691/93 CENTRO DE CONVIVENCIA CRISTIANA "SINAI"
DOMICILIO CONOCIDO, CHALMA, MALINALCO, C.P. 0, Tel. JUAREZ N° 5, COLONIA COACALCO, COACALCO, C.P. 55700, Tel. DE JUAREZ, C.P. 53120, Tel. MZ. BENITO JUAREZ S/N, PUEBLO EMILIANO ZAPATA, IXTLAHUACA, C.P. QUINTANA ROO N° 409 SUR, COLONIA GRANJAS, TOLUCA, C.P. 50590, Tel. 3 DE MARZO LOTE 5, COLONIA LAZARO CARDENAS, CUAUTITLAN, C.P. SGAR/825/93 IGLESIA PENTECOSTES "EL REDENTOR"
REVOLUCION, CHICOLOAPAN, C.P. 56370, Tel. ASTAHUACAN, IZTAPALAPA, C.P. 9500, Tel. CALLE ORIENTE 7 N° 208, COLONIA REFORMA, NEZAHUALCOYOTL, C.P. AZTECAS NO.33, FRACC. LA ROMANA, TLALNEPANTLA, C.P. 54030, Tel. RIO TEHUANTEPEC LT.6 MZ.61, COL. EL SALADO, LOS REYES LA PAZ, C.P. EX-HACIENDA DE TULTENANGO, EL ORO, C.P. , Tel. DOMICILIO CONOCIDO, AMECAMECA, C.P. 56900, Tel. "YEHOSUA: JESUS ES MI SALVADOR"
LAGO CUITZEO N° 158, COLONIA AGUA AZUL, NEZAHUALCOYOTL, C.P. CERRADA DE CRUZ RUIZ N° 1, COLONIA CENTRO, TEMASCALCINGO, C.P. EMILIANO ZAPATA N° 40, BARRIO SAN ANTONIO LA FE, XONACATLAN, C.P. SAGRADO CORAZON DE JESUS, TOLUCA, MEX. CAPILLA DE JALTEPEC, ALMOLOYA DE ALQUISIRAS, C.P. 51860, Tel.